Walmart is having their fun with Amazon Prime Day by offering a sweepstakes for $119 gift cards or a $1,119 grand prize. Why the $119? Well, that’s because that’s how much an Amazon Prime membership costs. Walmart also wants you to know that they do free 2-day shipping with NO membership fee. 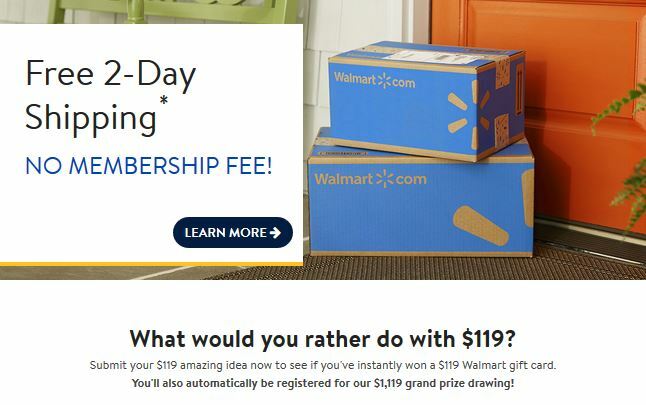 Tell Walmart what you would rather do with $119 and you could instantly win one of $119 Walmart gift cards AND be entered in the $1,119 grand prize sweepstakes! I would like to spend the $119 on fabric to make mug rugs to give away to unsuspecting people as gifts to make their day. Smiles smiles!! I would like to buy fabric to make mug rugs to give as gifts to unsuspecting people, I always get a smile and hugs. I’d like to spend the $119.00 on fabric to make mug rugs to give to unsuspecting people as a gift. I receive smiles and hugs. Shakita is my personal needs assistant, she has 5 children and custody of a sisterschild as well. She works so hard with myself & 2 other disabled people. Plus a second job on the weekends. She would be so appreciative and blessed with buying school clothes and supplies. I pray she might receive even a portion of your generousity. So I’ve entered on her behalf and can’t begin to tell you just what a piece of Sunshine she is and a dedicated mother who struggles. Thank you for your consideration. I would love to buy quilting fabric so I could make a quilt for my son. Next post: FREE Idaho Spuds VeggieMash Samples!